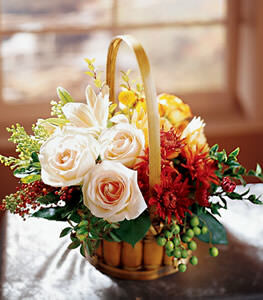 Put a pastel spin on autumn with this bouquet of peach roses, peach Gerbera daisies, yellow roses, and white lilies. Fall berries and maroon pompons add great fall color. Arrangement arrives in a handled basket. Just wanted to tell you thank you for your awesome service. The flowers were received and she loved them. I know who I will order my flowers and tell others to order from now on.